The trans* community has been fully embraced – and honored — as part of PrideFest Milwaukee’s history and heritage since we first united, 28 summers ago in Mitchell Park. Even without a permanent home, funding, political support or an entertainment line-up, the first PrideFest demonstrated how pride in one’s self and one’s community can unite people with a shared vision — against all odds. Those values remain at the heart of PrideFest Milwaukee, and Milwaukee Pride, Inc., to this day. For that reason, PrideFest Milwaukee is increasingly concerned about our reputation as a safe place for our trans* guests and their loved ones. We are disappointed that our organization, policies, and long-standing provisions may have been misrepresented. We apologize for any anxiety, confusion or doubt this misinformation may have caused. We are the only LGBT+ pride festival in North America with permanent festival grounds, including full-service restrooms not typically provided at a pride event. We do not own the PrideFest grounds. As a 3-day tenant, we are accountable to our rental agreement, local zoning regulations and public health codes. Our inclusive restroom policy – since arriving on the Summerfest grounds in 1996 – has been that our guests choose the restroom they prefer to use. This is not the provision at any other festival, nor any other major event, venue or business in our market. It has, however, been the standing policy of PrideFest Milwaukee for decades. Since 2003, we have designated the only open, publicly accessible, single-user restroom within the festival footprint as a gender-neutral restroom to support those who do not identify within the gender binary, and to accommodate anyone not comfortable using a shared restroom. We do not police restrooms by gender. There are no signs stating that your restroom choice must match your ID, nor do our security guards have the authority to challenge our guests’ choice of restrooms. While we cannot control the actions of our guests, we can and will confront disrespectful behavior if it occurs. Any incidents should be reported immediately to PrideFest security. Additional gender-neutral restrooms will be designated at the Wominz Spot and Loft Stage, as single-user, private facilities. All gender-neutral bathrooms will be marked with visible, clear and confirming signage. A visitor map of all gender-neutral restroom locations will be available for download in advance of opening day at our website — and available for pickup at the festival information desk. PrideFest’s inclusive restroom policy and Code of Conduct will be posted at the festival entrance as a reminder for all guests. “We are living in times where laws are being proposed that would have trans* people jailed for using bathrooms — and private citizens financially rewarded for reporting them. These laws serve no other purpose than to blatantly discriminate. 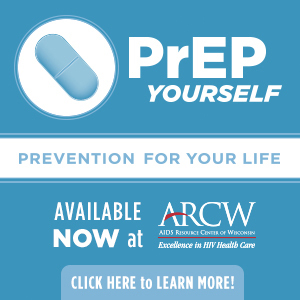 Although these laws haven’t arrived in Wisconsin, we must combat even the idea of such laws, with increased inclusion, visibility and awareness,” said Jessica Baker, representing the Milwaukee Pride, Inc. Board of Directors. PrideFest Milwaukee will be inviting the local trans* community to join a public listening session in April. The goal of this session is to build stronger communication between our organization and the community we serve. Watch for details on our website and social media accounts. Want to help build a better festival that all visitors can feel proud of? As an all-volunteer organization with no paid employees, PrideFest Milwaukee is reliant on the support of volunteers willing to step up, take action and live proud. Interested? Please contact info@pridefest.com. The mission of PrideFest is to celebrate the diversity of lesbian, gay, bisexual and transgender (LGBT) culture and community. 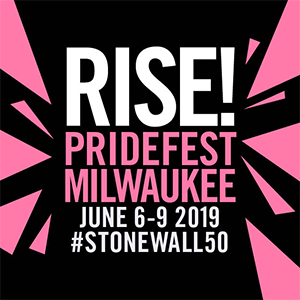 PrideFest is accomplished through the work of the Milwaukee Pride, Inc. Board of Directors, which oversees year-round organizational business, and the Production Team, which plans and implements the day-to-day operations of the weekend festival. Each year, this unpaid volunteer team is committed to securing all resources necessary to produce the safe, memorable and meaningful experience you deserve.